ReceiptParse®Technology That Delivers Mobile Receipt Capture That’s Second to None. Certify’s patented ReceiptParse® technology offers exclusive auto fill and extraction technology that makes managing receipts and expense reports from the road fast and easy. With the highest parsing accuracy available, no other expense management system performs like ReceiptParse®. And it’s all included at no extra cost to you. Never worry about another lost receipt. 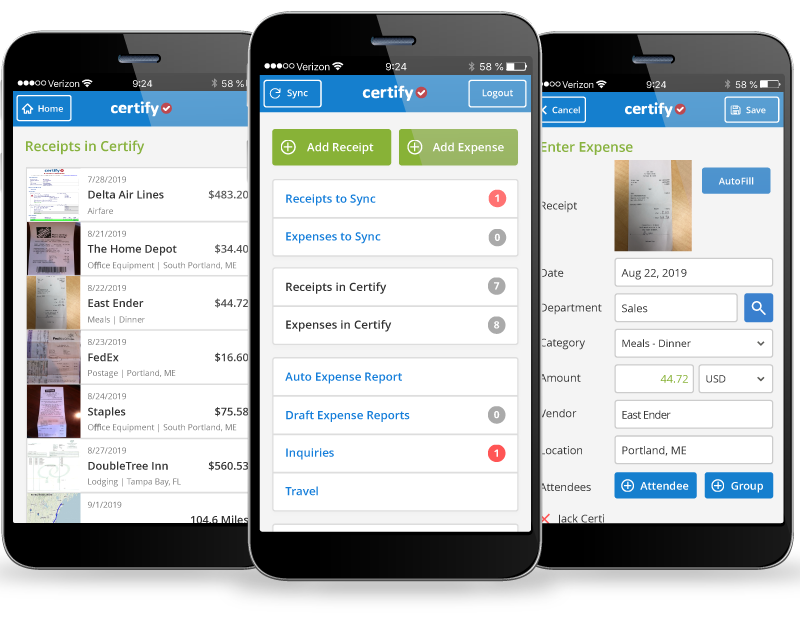 Certify is the easiest, most secure way to capture receipts on the road. 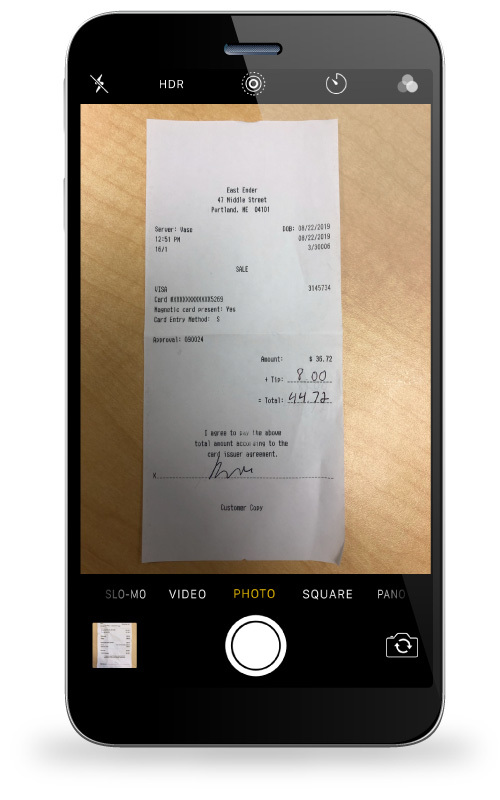 Take photos of receipts from any smartphone or tablet. Select autofill to extract data from the receipt automatically. Review data against original receipts and save images to the report. After a receipt is loaded into Certify, the system automatically extracts expense data and fills in the corresponding fields. 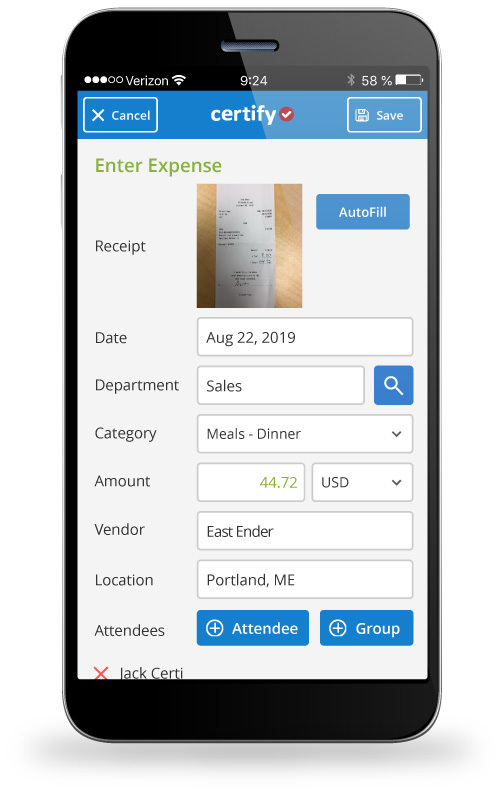 In just a few seconds, amount, location, vendor, date, category—up to 15 expense fields—are automatically captured and populated. When it's time to review reports, expense items have already been categorized and formatted directly from receipt images. No smartphone? No problem. Choose from any one of our 11 ways to capture and upload receipts. And when it's time to review reports, expense items have already been categorized and formatted directly from receipt images. The first time you expense a meeting at the local café and tag it as “Beverage” category, next time Certify will automatically identify the vendor and do it for you. If it’s a recurring meeting with the same attendees, Certify recognizes the pattern and saves you the trouble of entering the details again.